Asking For A Friend: How Much Is Too Much? The short answer to all these questions: It’s complicated. (Isn’t that the answer to any legal question?) 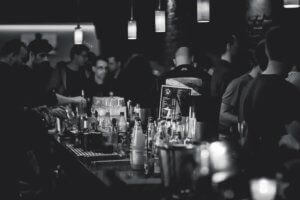 To get a sense of why that is, you need to understand a bit about how alcohol affects the body and how Blood Alcohol Concentration, or BAC, is calculated. When you drink an alcoholic b everage, your stomach and small intestine begin absorbing the alcohol into your bloodstream (although some alcohol is actually absorbed as soon as it enters your mouth, through your gums). The rates at which alcohol is absorbed depends partially on a person’s weight and gender (but also on other factors, discussed below). A heavier person will have a lower BAC than a lighter person after drinking the same amount, because the alcohol is more diluted throughout the body. Women and men absorb alcohol differently as well, to some extent regardless of weight − this is partially because women have more body fat than men do, and fat does not absorb alcohol. It is also because women have less dehydrogenase, an enzyme that breaks alcohol down. In short, women become impaired more quickly than men do, and after consuming less alcohol. Perhaps obviously, a person’s Blood Alcohol Concentration will go up more quickly if they are drinking very quickly. Interestingly, though, stronger alcohols are absorbed more slowly because they irritate the mucous membrane of the stomach. Carbonation will also affect absorption rates − carbonation speeds up the process. It is important to note that your Blood Alcohol Concentration can continue to rise for up to 2 hours after your last drink. Alcohol leaves the body by being metabolized by the liver, the function of which is to (among other things) detoxify the body by breaking down harmful substances and removing them from the bloodstream. The liver produces dehydrogenase, which eventually breaks the alcohol down and turns it (like all food) into energy. This reduces Blood Alcohol Concentration by 0.015 per hour in a normal person. Essentially, intoxication occurs when a person drinks alcohol faster than the liver can metabolize it, because that alcohol remains in the bloodstream. This is where the oft repeated “one drink per hour” comes in. At least in theory, one drink per hour allows the liver to keep up with alcohol consumption. So what do blood alcohol concentration numbers mean? Obviously, blood passes through your entire body, including your brain (which is what causes intoxication). A blood alcohol concentration of 0.08% means that there is 0.08 grams of alcohol in every 100 milliliters of blood. 0.08% is the legal limit in Georgia. The number is based on the blood alcohol concentration at which the average person will have impaired motor function and therefore be unsafe to drive. That means that in some ways this is an arbitrary number, because not all people will actually be unsafe to drive at 0.08%. The law (at least theoretically) treats everyone the same, though, so if you take a state-administered chemical test and are found to be above 0.08%, you are almost certainly looking at a DUI charge. If alcohol is in the blood stream, how does it get into the lungs and show up on a State-Administered Breath Test? As blood flows through the body, it passes through the lungs. A state-administered breath test detects the alcohol that seeped from your bloodstream into the air in your lungs, which you then expel into the test, which approximates (with debatable degrees of accuracy) your BAC. So how do drinking water and eating food in conjunction with consuming alcohol affect Blood Alcohol Concentration? Adding water or food* will dilute the alcohol, slowing absorption and resulting in a lower peak Blood Alcohol Concentration. But it will not stop absorption altogether. Your blood alcohol concentration will continue to go up, but at a slightly slower rate than if you were drinking on an empty stomach. For a normal person drinking on an empty stomach, Blood Alcohol Concentration will spike and start declining 30 minutes to 2 hours after consumption of alcohol. For a person who has eaten a large meal or drunk a large quantity of water, peak may occur between 1 and 6 hours after consumption. *Some foods are definitely better than others at slowing absorption. There is some evidence to suggest that fatty foods are best, because the fat forms a coating on the stomach which the alcohol cannot penetrate (as gross as that sounds). Can I get arrested for DUI if I’ve only had one drink? The short answer is “yes, depending on the circumstances.” While I discussed the “one drink per hour” rule above, this rule is not foolproof because every person’s body is different. People with a compromised liver would metabolize alcohol more slowly, and certain medications may interfere with liver function. Furthermore, serving sizes vary, and many people actually don’t realize how much alcohol is in “one drink.” For this reason, the National Institutes of Health provides a handy interactive “Drink Size Calculator” so that users can be more aware of how much alcohol they’re actually consuming. Check it out here. And finally, a DUI arrest requires only probable cause. Probable cause is determined based upon a “the totality of the circumstances.” So if a person runs a stop sign, or even forgets to signal, or makes any other number of driving mistakes, he or she may be pulled over. If he or she then admits to having a drink, then fails the Standardized Field Sobriety Tests (which are difficult to pass even for a person who has not been drinking), that is likely sufficient probable cause for an arrest. The State Administered Chemical Test is done after arrest, once the driver has already been transported to the police station. 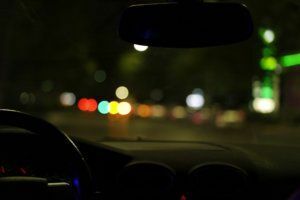 The test may ultimately vindicate the driver if it shows that they are under the legal limit, but they have still gone through the embarrassment and stress of an arrest. The driver also may still be charged with DUI Less Safe, which carries the same penalties as a DUI Per Se. I should also note that partaking in substances other than alcohol, whether alone or in conjunction with alcohol, can also lead to a DUI arrest. This includes prescription medications. A note on roadside breath tests: Many police officers carry portable breath tests (PBTs) that they administer on the side of the road when a person is suspected of DUI. This is different than the State-Administered Breath Test, both legally and in the way it functions. These PBTs measure only the alcohol in a person’s mouth, not the alcohol in their blood. As a result, they are not very accurate and while they do show a number, that number is not admissible in court. They are typically used to develop probable cause for an arrest. Legally, they do not count as a State Administered Breath Test, so a driver can submit to a PBT but refuse the State-Administered Breath Test and still face the penalties of refusing a breath test. In sum, I can’t answer any of your questions with any degree of certainty, and it would be irresponsible for me (or any other lawyer) to try, because every person’s body is different and there are many factors which affect a person’s Blood Alcohol Concentration. I always recommend that people who are planning on drinking any amount plan for an alternate ride home. Uber and Lyft are great options, since most cities in Georgia are not known for having fantastic public transportation options (sorry, MARTA). If you have more specific questions about something I’ve talked about here (or something I haven’t covered), please feel free to reach out.